This is an astonishing truth. Average real wages in the UK today are worth 5% less than they were precisely a decade ago. This chart is from the Office of National Statistics. I often see wage stagnation referenced in the media. It is only stagnation if your baseline is post bank crash. If your baseline is a decade ago, it is not stagnation but collapse. This is the worst decade for real wages since at least 1814-24, and I would argue this is worse than that. It is also worth noting that sharp recession also was triggered by a reduction in public spending, albeit from much lower levels. One constant theme from the Labour Party in the election campaign, which gained traction, is that the last Labour government did not overspend. It was the banking crisis which crashed the economy. Up to a point. The last Labour government did in fact overspend disastrously. But not on public services. Brown and Darling overspent on pumping incredible amounts of public money into bailing out the banks. That is what caused the initial massive inflation of public debt. The huge irony is of course that the interest on the debt is paid to – the same bankers who received the money as a bailout. It is fashionable for right wingers to argue that the bank bailouts somehow did not really happen, or did not really cost anything. That rewriting of history is gaining much strength in mainstream media narrative. But the National Debt was 36% of GDP in 2007 (and on a downward trend) but leapt to 60% of GDP by 2009. That was the bank bailout. The bank crash bailout triggered the austerity policies designed to repair the public finances, but which stifled economic growth. The lack of growth allied to neo-liberal deregulation of the labour market, and in particular the massive diminution in the role of unions, have caused the collapse in wages. The government is fond of claiming that in this period the income gap between the top 10% of earners and the bottom 10% has shrunk slightly. That does appear to be true. But it is not the key figure. The gap between the top 1% of earners and the bottom 99% of earners has more than doubled during this decade. What has happened is that society has returned towards a more Victorian model. One per cent are super rich, everybody else is getting poorer and differentials are slightly shrinking. It particularly interests me that the income disaster for ordinary people has been worse and more sustained than it was following the financial disaster of the 1930’s. I opposed the bank bailout at the time, and I am now convinced that I was right. The bad banks should have been allowed to crash. For the government to give people and companies their cash under the deposit guarantee scheme would have cost the public purse less than 10% of the money spent on the bank bailout. The property bubble would have collapsed, making property realistically valued in relation to earnings and avoiding the landlord/tenant society we are becoming. Bad bankers would have lost their jobs and a salutary lesson have been learnt the hard way on banking practices – instead we have had the opposite effect where bankers now believe they can do anything and will always be bailed out. The bailout was a massive perverse incentive. Crashed banks would have been taken over by other better run banks that had not crashed, or new banks would have arisen. This is how economies progress. It is possible the immediate recession would have been deeper. Top end London property, Porsche sales, cocaine and lap dancing would all have taken big hits. But there would have followed the kind of strong and sustained recovery with real growth seen in all previous historical financial crashes, instead of this lengthy crippling pain. There are of course many other factors affecting the economy, which makes it very hard to isolate the effect of the UK banking bailout. But in the same decade Germany, France and Italy have seen growth in real wages. Mistaken continuation of the attack on public spending has of course made the situation much worse. But given the disaster for ordinary people that has ensued and been with us so very long, I think it would be very difficult for anybody to argue that life would be worse had the bank bailout not happened. It is remarkable to me that this root cause of so many of our woes is almost never referenced n the media nowadays. New Labour were not only responsible for much of the financial deregulation that made the great crash possible. Policies such as the Public Finance Initiative were simply devices for pouring billions of pounds in public spending straight into the pockets of the bankers. To bail out their city friends with the money of everybody else required no thought from Darling and Brown. Lord Darling has of course been having a little money poured into his personal pocket from the bankers almost ever since. There is a special circle of Hell reserved for Brown and Darling. Peculiarly, I have never seen the question asked anywhere. But please, knock yourself out with ideas. What do you think would have happened by now if the banks had been allowed to crash? In response to a comment, I have looked at Icelandic real wage growth in this period. Iceland let banks fail. Of course its economy has different qualities to the UK, but there may nonetheless be some interest in the comparison. In fact, exactly as I postulated above might have happened in the UK, after a sharper initial downturn, real wages in Iceland then recovered extremely healthily, giving very strong overall real wage growth for the whole period. NB this graph is measuring something different to the above UK graph. 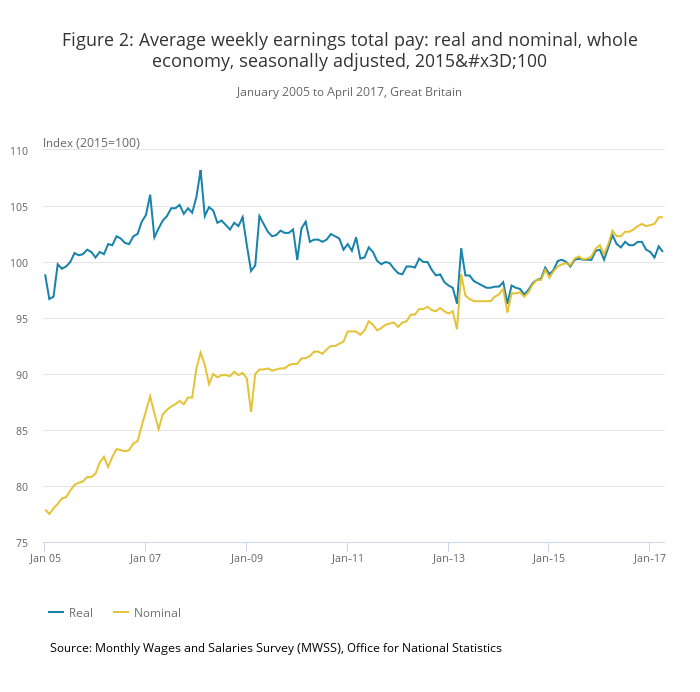 The UK graph is measuring the level of wages in constant 2015 real terms. The Iceland grow is measuring the rate of growth in real wages. While the two economies not being entirely comparable, this cannot prove my thesis, it certainly does support it. This is a very interesting posting from a blog which shares my belief that it is wrong to view globalisation and neo-liberal deregulation as tied together or part of the same process. Globalisation is good. Deregulation is bad.